Samsung Electro-Mechanics is spending $88 million on expanding its plant in Vietnam, while Inteflex is planning to make a similar investment of its own, The Korea Herald said on Monday, quoting another Korean publication, The Bell. Apart from Samsung and Interflex, Apple is expected to source FPCBs from a third firm —BH —which also recently grew production in Vietnam. Orders for Samsung and Interflex will allegedly be decided when production starts in April or May. About 60 million OLED-equipped iPhones should be produced this year, representing 40 percent of new devices, the Herald said. Adoption is forecast to double in 2018, and by 2019, Apple is predicted to use OLED in all its new models. The basis for the latter claim is unknown, but in recent years Apple has taken a policy of gradually migrating high-end features to cheaper models. The 4.7-inch iPhone 7, for instance, now includes optical image stabilization, something that was previously reserved for the 5.5-inch iPhone 6 Plus and 6s Plus. Apple is expected to ship three new iPhones this fall, including the "iPhone 8," and two "7s" models using 4.7- and 5.5-inch LCDs like the iPhone 7. All three are expected to offer wireless charging, as well as faster wired charging via Lightning. 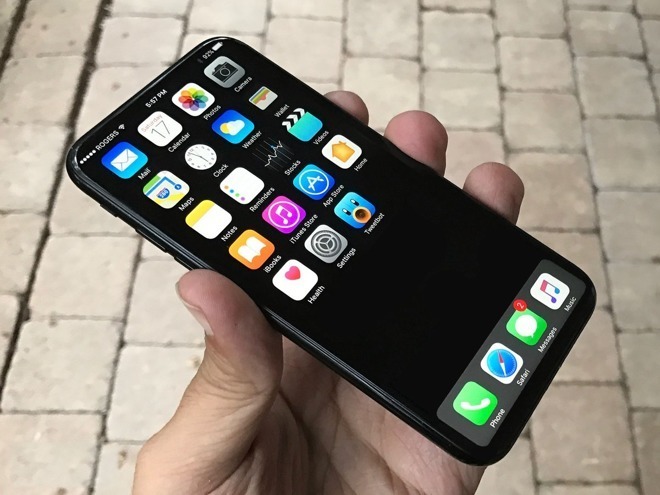 The "iPhone 8" will likely use a 5.8-inch OLED display, with about 0.7 inches of that being dedicated to virtual buttons replacing a physical one. It may also offer 3D facial recognition, iris scanning, and/or a new form of fingerprint sensor.